Ukrainian crisis could be an opportunity to complete the task of establishing equilibrium in the former Soviet space. The spectre of a new Cold War is haunting Europe. The crisis in Ukraine, exacerbated by Crimea’s parliament vote in favour of joining Russia, threatens to evolve into the classic, stereotypical West versus the Kremlin confrontation. To understand what the possible outcomes could be, it is important to recount how matters reached this stage and Moscow’s perception of these developments. In November 2013, then Ukrainian President Viktor Yanukovych (still accepted by all parties as democratically elected) decided not to sign the association agreement with the EU. Instead, he opted for the Russian economic bailout package — $15 billion plus natural gas at discounted prices. 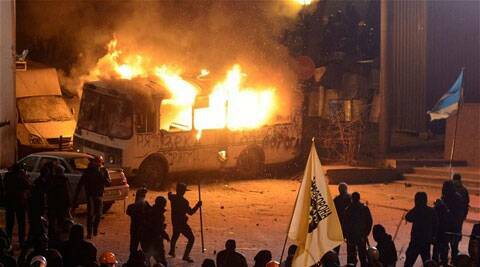 Protests ensued, with thousands occupying central Kiev. Initially, there was a carnival air about the protests — fiery speeches, foreign dignitaries, including ministers mingling with and speaking to the protesters. Senior US officials were photographed distributing sandwiches to anti-government demonstrators. Mysteriously, the police action was halted and the opposition invited for talks. The negotiations resulted in an agreement on February 21 that was a virtual surrender by Yanukovych. The agreement, countersigned by three European foreign ministers, was summarily dismissed by the protesters, who were by now led by radical nationalists. No one, including the three ministers, appeared to object. Yanukovych fled the capital, surfacing later in southern Russia. The Ukrainian parliament, meanwhile, anointed an interim president, Oleksandr Turchynov, and subsequently a cabinet of ministers led by Prime Minister Arseniy Yatsenyuk. Moscow viewed these developments as a coup manufactured by radical Ukrainian nationalists with full support of the US and Europe. The Kremlin fears that Kiev will now pursue aggressive pro-Western policies — not only looking for economic integration with the EU but also seeking membership of Nato, discarding the neutrality it undertook to maintain in 2010. Moscow also fears that Ukraine may seek to reopen the question of the Crimean port of Sevastopol being a base for Russia’s Black Sea fleet. Russia fears that the loss of the Crimean base will alter the strategic balance, making the Black Sea a large Nato-dominated lake. Given this background, Moscow moved swiftly to secure Crimea, which neither Russia nor most Crimeans have ever accepted as being part of Ukraine. Crimea’s “gifting” to Ukraine in 1954 by Soviet leader Nikita Khrushchev had little significance while the USSR existed, but became a contentious issue with the collapse of the Soviet Union. Russia will not withdraw from Crimea without significant concessions from Kiev, which the current dispensation in the Ukrainian capital is unlikely to agree to. The best-case scenario for Ukraine’s territorial integrity would be a confederacy with Crimea. If not, in all likelihood Crimea will be absorbed into the Russian Federation. The Crimean parliament vote is a precursor to this eventuality. Russia is unlikely to repeat the Crimean scenario in eastern and southern Ukraine, primarily because this would lead to a long and bloody war, which will inevitably draw in the West. If the authorities in Kiev do not show adequate statesmanship and tolerance, a humanitarian refugee crisis may develop in Russia’s neighbouring areas. Ethnicity is an important aspect in the crisis. “Kievan Rus” is the cultural inheritance claimed by eastern Slavs. It was the first confederation of east Slavic tribes in the territory from the Baltic to the Black Sea. It was in Crimea that Prince Vladimir in the 10th century accepted Christianity, converting the entire population of Kievan Rus. Indeed, “Ukraine” means border lands or “lands at the edge” — clearly an apt description when viewed from Moscow. A solution to the Ukrainian imbroglio lies in shedding old Cold War stereotypes and treating the crisis as an opportunity to complete the unfinished business of establishing geopolitical equilibrium in the former Soviet space. In the triumphalism after the collapse of the Soviet Union, evolving and institutionalising the new rules of engagement in the post-Soviet space was forgotten. Russia believes that it has a natural sphere of influence that the rest of the world must recognise. Finland is probably the example that Russia would like the states on its borders to emulate — economic engagement with the West if desired, but military neutrality. Whatever the outcome, it is not going to be business as usual. The spectre of a full-blown Cold War will unlikely materialise — probably a Cold War-lite, with continuing cooperation between Russia and the West in crucial areas like Syria, Iran, Afghanistan and North Korea. What should India do? India would do well to follow developments closely and analyse the interplay between big states and smaller neighbours. India is not a player in the current Ukrainian crisis, although it has good relations with all parties involved and significant strategic partnerships with some of them. Therefore, following the adage that “one can never be hurt by what one has not said” may be the most sensible policy for New Delhi.